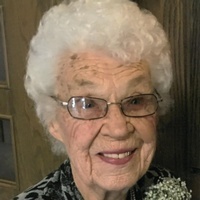 Edna Mossestad, 101, passed away peacefully on Thursday, January 24, 2019 at Sanford Hospital in Thief River Falls, MN with her loving family at her side. Funeral service to celebrate Edna’s life will be held at 2:00 PM on Saturday, February 9, 2019 at Zion Lutheran Church in Thief River Falls, MN with Rev. Ale Tulu and Rev. John Golv officiating. Lunch and fellowship will follow in the church dining hall. Burial will follow at Greenwood Cemetery in Thief River Falls, MN. 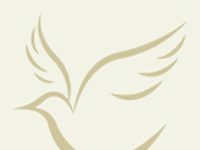 Visitation will be held one hour prior to the service. Edna Pauline Paulson was born May 21, 1917 in Stephen, MN the daughter of Jon Olof and Emma (Sjo) Paulson. She was baptized on August 7, 1917 and confirmed in 1931 at Salem Lutheran Church near Stephen, MN. The family only spoke Swedish as Edna was growing and she had to learn English in order to attend country school, which she completed through 8th grade. Edna left home at the age of 17 and worked for several different families until she married Kenneth Wendel on June 24, 1937 in Argyle, MN. His job took them to four different states before they returned to Thief River Falls in 1945 where they continued to reside. To this union three children were born, Sharon, James and John. Edna was a stay at home mom until the kids were through school. She then went to work part time as bookkeeper and secretary in Ken’s real estate business. Later on, they built a shed and raised chinchillas as a sideline. Kenneth passed away in 1972 at the age of 62 from a heart attack. Eight years later on July 12, 1980 Edna was united in marriage to Oscar Lewis Mossestad at Zion Lutheran Church in Thief River Falls. She welcomed Oscar’s four children Carole, Sharon, Orvis and Arlys. The couple enjoyed woodworking, flower gardening, and traveling to visit relatives. Oscar passed away on November 11, 2005. Edna continued to reside at her home in Thief River Falls up until the day before she died…she was a strong woman! She enjoyed being outdoors, tending to her flower garden, sitting on the patio with a cup of coffee, birds & scenery and spending time with her little dog Cookie. In the winter months she enjoyed quilting, painting bottles, saw blades, pictures and anything else she could paint. Edna especially enjoyed visiting with family and friends. 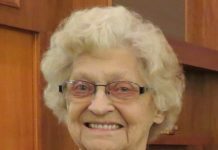 Edna was a member of Zion Lutheran Church for over 70 years. She was also active with the Ladies Church Circles and was on the Building Committee when Zion Lutheran Church was built. Survivors include her daughter Sharon (Bill) Hoglo of Thief River Falls; sons James (Farryle) Wendel of Spokane, WA and John (Barbara) Wendel of Lino Lakes, MN; grandchildren, Jennifer (Paul) Johnson, Steven (Rosemary) Johnson, Cara (Matt) Wurst, Wayne (Pam) Wendel, David Wendel, Krista Wendel, Lisa (Doug) League and Jenny (Greg) Hans; grandson-in-law Jerome Maki; great-grandchildren Rachael (Ben) Largis, Eric (Elizabeth) Lagerstrom, Kyle (Shawna) Lagerstrom, Nicholas (Jennifer) Lagerstrom, Michael Lagerstrom, Aleshia Lagerstrom, Rebecca (Tyler) Iwen, Andrew Johnson, Brandon (Bailey Anderson) Bruggeman, Paige (Brandon) Langaas, Ty Johnson, Kyra Wurst, Grace Wendel, Luke Wendel, Michael League, Katherine League, Charlie Hans, Ava Hans; great great-grandchildren Kiera & Aubree Largis, Reily & Tristen Lagerstrom, Myla Askeland-Holmes, Blake Rose Bruggeman, Bauer James Langaas; siblings Nanne Entner of Mount Lake Terrace, WA, Kennard (Nadine) Paulson of East Grand Forks, MN and Lyle (Colleen) Paulson of Thief River Falls, MN; step-children, Carole (Vernon) Konickson, Red Lake Falls, MN, Sharon (Larry) Efteland, Thief River Falls, MN, Orvis (Donna) Mossestad, Plummer, MN and Arlys (Roger) Konickson, Plummer, MN and their 11 grandchildren, 25 great-grandchildren & 4 great great-grandchildren; and many other family and friends. 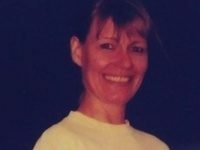 She is preceded in death by husband Kenneth; husband Oscar; granddaughter Natalie Lagerstrom Maki; grandson-in-law Donald Lagerstrom; sister Doreen (Irvin) Anderson; brother-in-law Maurice Entner; and step-granddaughter Brenda Peterson.